Join us as we welcome Cutts Farms to the Yankton Chamber! 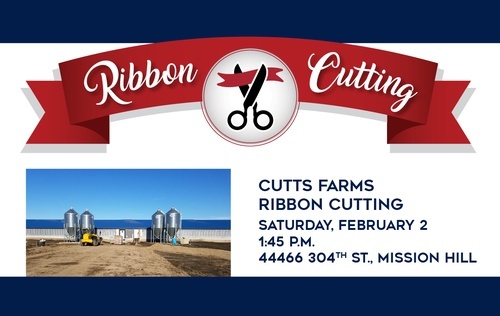 This ribbon cutting will be followed by an open house of Jay and LeAnne Cutts' new Swine finishing unit. Learn about the changing pork industry and how every measure is taken to ensure safe, high quality pork all while reducing the carbon footprint of today's agriculture.